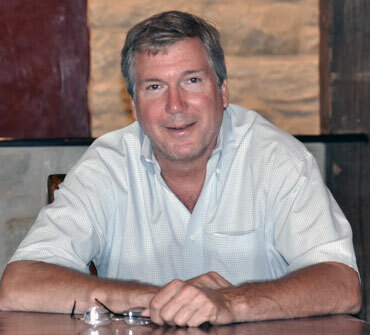 Chris Heidrick, (Tau '76) executive vice president of the nationally recognized Solis Constructors, Inc., served as general contractor for the construction of the Lodge. Austin-based Solis Constructors provides high quality construction services for a variety of projects throughout Texas, including industrial, retail, military, medical, commercial and residential. 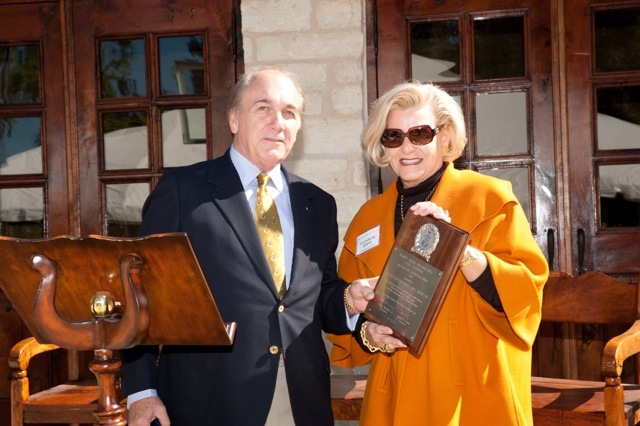 In 2007, Solis Constructors, Inc., received Contractor of the Year Awards from both The City of Austin and from the U.S. Hispanic Contractors Association, as well as the Excellence in Construction Merit Award from Associated Builders and Contractors, Inc. for construction of the Mexican American Cultural Center. The Tau Chapter extends its deepest gratitude to Chris Heidrick and his team at Solis Constructors for their outstanding work in building the Lodge. It's a truly exceptional building that will enrich the lives of Kappa Sigma brothers for many generations to come. 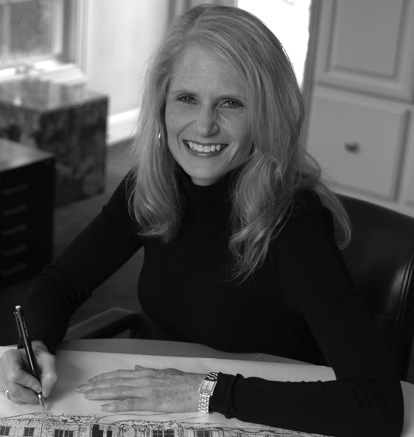 With more than 30 years' experience, Katheryn Lott has distinguished herself as one of Central Texas' premier architects of high-end residential and commercial architecture. Modern, organic design that honors the natural beauty of its materials and the space that it inhabits is a trademark of her work. Committed to responsible and sensitive land planning, Ms. Lott's firm specializes in restoration and renovation of historic structures and adaptive reuse projects. An extensive background in space planning and interior design is also exemplified in all of her work, regardless of scope. 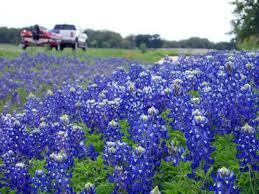 Ms. Lott graduated with honors from The University of Texas with a Bachelor of Architecture in 1974. To view her portfolio, visit her at klottarchitects.com. On behalf of the Tau Chapter, we offer our heartfelt appreciation to Katheryn Lott for sharing her extraordinary talents and expertise to give us an even finer structure than we could have imagined. Now you can pay your dues safely online with a PayPal account. The Tau 125 Campaign has been a huge success - but we're not there yet. Before we begin construction on the new Chapter House, we must reach our fundraising goal of $5 million. We're now only $1.7 million shy of reaching that goal in pledges. If you have not yet contributed, please accept the challenge to raise your class's level of participation and pledge your gift today. Your gift will help Kappa Sigma continue its legacy as the premier fraternity at the University of Texas. As Dr. Denton A. Cooley '38 expressed so well, "This is an opportunity for all alumni to pay our respects and our debt to Kappa Sigma." Please take those words to heart and pledge your Tau 125 Campaign gift today. The beautiful photographs of the Lodge appearing in this newsletter and on the Tau Trustees website are the work of professional photographer Chris Bailey (Tau '04) of Houston. 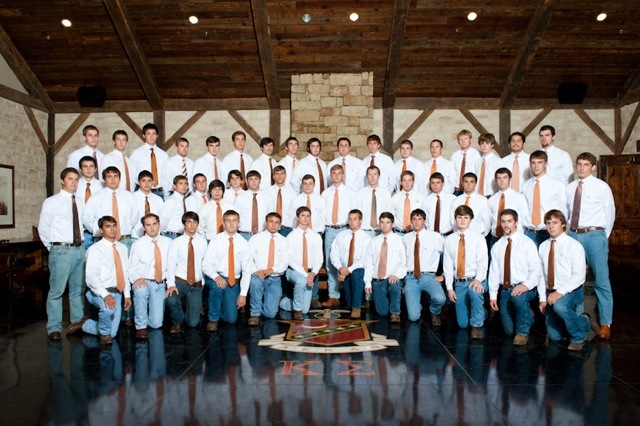 Chris also photographed the 2010 KS undergraduates as well as this year's pledge class. Thank you so much, Chris! Please share the latest news in your own life for the "Alumni News" segment. We welcome news and photos of your recent accomplishments, honors, recognitions and family news (e.g., anniversary celebrations, new babies, grand babies, special travel experiences, etc.). 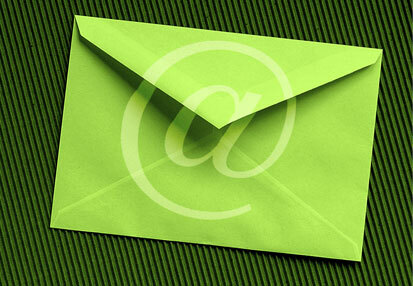 Please send news and photos to editor@kappasigtauut.org. Being chosen Tau Man of the Year is truly one of the greatest honors of my life. I thank you from the bottom of my heart. Even more gratifying has been the opportunity to reconnect and work along side each of you to accomplish all that we have to continue the esteemed Kappa Sigma and Tau legacy at the University of Texas. It has also been my privilege and honor to work with and mentor the finest young men attending the University of Texas today. My Kappa Sigma brothers have always been -- and will always be --- my extended family. Thank you for your lifelong friendship and support. The opening of our new Lodge this year is a wonderful milestone that we can all be proud of. Quite a legacy to leave our Chapter. 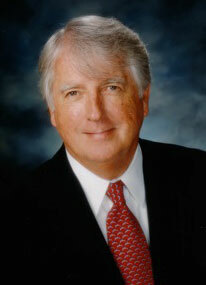 Hagen McMahon (Tau, University of Texas, '66) was honored as Kappa Sigma's 2010 Tau Man of the Year on November 13. More than 450 people -- including University of Texas alumni, undergraduates, friends and family members -- gathered to pay tribute to McMahon for his outstanding service to the Tau Chapter. "Some may equal, but none excel" is a statement tailored for Hagen McMahon and the contribution he has made to our Chapter," said longtime friend, pledge brother and 2002 Tau Man of the Year Joe Longley. "He is-and always has been -- totally devoted to the Alumni, Actives & Pledges of Tau Chapter of Kappa Sigma -- which is the living spirit of our Brotherhood created at 203 W. 19th over 100 years ago". 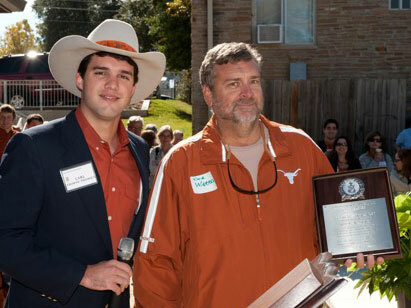 McMahon is past president of the Texas Kappa Sigma Educational Foundation, Inc., and now serves as chairman of the Tau Trustee and Alumni Association. In 2005, he was awarded the John G. Tower Distinguished Alumni Award and -- for three consecutive years beginning in 2005 -- was the recipient of the Tau Chapter's Frank C. Erwin Award. Dan Burck, former Chancellor of the University of Texas System and 2002 Tau Man of the Year, said "As UT fans we often say 'I bleed orange.' Hagen McMahon bleeds not only orange, he bleeds the colors of Kappa Sig: red, green and gold." George Alcorn, 2009 Tau Man of the Year, presented the award to McMahon. In his acceptance, McMahon, a second generation Kappa Sig, spoke lovingly of his father, Hagen McMahon, Sr., who passed away earlier this year, and his deceased uncles, Dr. Jack McMahon and Bayard McMahon, all Kappa Sigs whose lives, said McMahon, exemplified the Kappa Sigma values of honor, integrity and loyalty. McMahon is a principal of The McMahon Group, providing business management consulting services to a wide range of private, corporate and government entities. He was an advisor on banking legislation and regulation concerns to four U.S. Presidents, served as executive director of The Independent Bankers Association of Texas and has served as a board director on numerous bank and corporate boards throughout Texas. He holds a Bachelor of Business and Economics from the University of Texas and a Master's degree from Southern Methodist University's School of Banking. 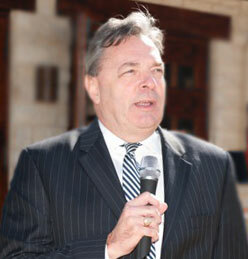 McMahon lives in Austin with his wife, Susan. They have two sons, a daughter and one granddaughter. 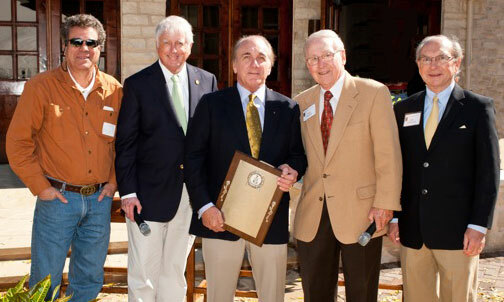 Kappa Sigma's 2010 Tau Man of the Year Hagen McMahon (center) with fellow Tau Trustees (left to right) Joe Bailey, Tau '73 and Tau Man of the Year 2005; George Alcorn, Tau '53 and Tau Man of the Year 2009; Dan Burck, Tau '51 and Tau Man of the Year 2001; and Joe Longley, Tau '61 and Tau Man of the Year 2002. 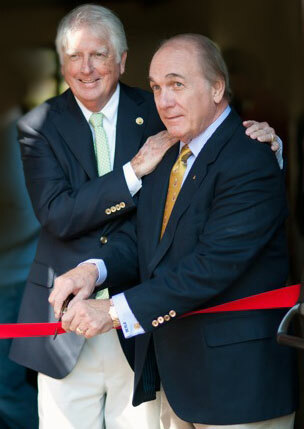 George Alcorn, Tau '53 and Tau Man of the Year 2009, along with Hagen McMahon, Tau '66 and Tau Man of the Year 2010, cut the ribbon to officially open the new Lodge. 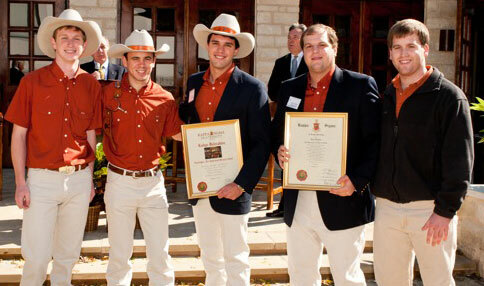 The Tau Chapter at the University of Texas officially dedicated its new Lodge on November 13, 2010, with more than 450 actives, pledges, alumni and family members in attendance. 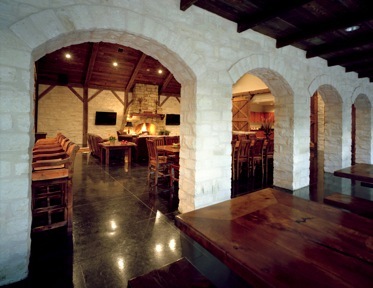 The Lodge, a spacious 5,400 square feet, provides a venue for Chapter events and meetings, a study hall and a dining hall with a state-of-the-art kitchen. 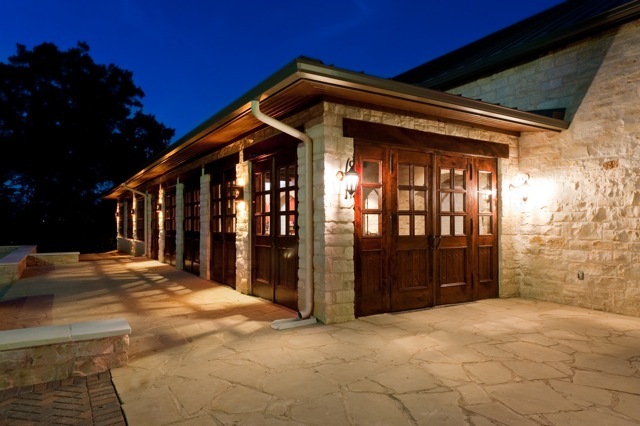 The stonework and architectural detail reflect Old World European craftsmanship and style, while the rustic charm of the imposing wood structures and interior furnishings provide the ambience of a Texas Hill Country retreat. The magnificent fireplace, constructed with dry-stacked stone, is a dominant and inviting feature of the grand room. The timbers used in the shiplap ceiling and the barn doors that provide entry to the kitchen originated from a 200-year-old Pennsylvania Amish barn, built without nails and held together by pegged mortise-and-tenon joints. The wood was transported to Fredericksburg, Texas, where it was milled and hand rubbed with lemon oil prior to installation. The doors, windows, tables, chairs, mantle and lintels are made of Mexican mesquite, one of the hardest and densest woods found anywhere in the world. 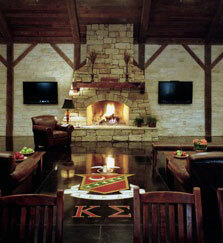 The concrete floor was stained and sealed with a technique that provides a refined marble-like finish, drawing the eye to the majestic Kappa Sigma Crest as the focal point of the Grand Room. An image of Bevo, the University of Texas' beloved Longhorn Mascot, is imbedded in the entry way to welcome all who enter. To commemorate the Lodge's dedication, Bill Wittliff (Tau '59) internationally recognized writer, film producer and photographer, donated a print entitled "Stolen Horses," originating from a photograph he took while on the movie set of "Lonesome Dove," for which he wrote the screenplay. Masterfully shot and handsomely framed, "Stolen Horses" is accentuated by a lamp made from a newel (circa 1922) salvaged from the original Kappa Sigma House located at 203 West 19th Street. The elegant outdoor wall lanterns that grace the entry way to the Lodge are also treasures from the original Tau Chapter House. Handcrafted in the 1920s, these stately lights are fitting reminders of the Tau Chapter's abiding respect for its past with an eternal optimism for its future. Carl Thorne-Thomsen, Tau '07, Tau Chapter Executive Committee president, and Rick Warren, Tau '78, recipient of the 2010 Frank C. Erwin award. Honorees (left to right) Ernest Hotze, Tau '08; Chan Tysor, Tau '08; Carl Thorne-Thomsen, Tau '07; Matthew Ziemnicki, Tau '08; and Jonathan Evans, Tau '08 were recognized for their outstanding contributions to the Tau Chapter at the annual Tau Awards Ceremony on November 13 during Parents' Weekend. Kappa Sigma Executive Director Mitchell B. Wilson addresses Tau Chapter brothers, family members and friends at the annual Tau Awards Ceremony held in front of the newly built Kappa Sigma Lodge. George Avery Alcorn (Tau '53) personifies the best of what it takes to be a successful independent oil and gas businessman in Texas. A visionary, decisive leader, astute negotiator -- and always the consummate gentleman and diplomat -- he generously shares his time, talents and resources to help make the Tau Chapter at the University of Texas one of the finest Kappa Sigma Chapters in the nation today. Honored as Tau Man of the Year in 2009, he was also presented the John G. Tower Award on behalf of the Supreme Executive Committee of Kappa Sigma Fraternity the same year. Alcorn has served as president of Alcorn Exploration, Inc., an oil and natural gas exploration and production company, since July 1982. He is past chairman of the Independent Petroleum Association of America and a founding member and past chairman of the Natural Gas Council. 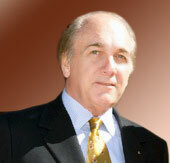 He currently serves on the board of directors for both Linn Energy, LLC and EOG Resources. An oil and gas businessman his entire career, he was awarded his industry's highest honor, the Chief Roughneck Award, in 1997. He and his wife, Libby, live in Houston. They have four sons, all Tau Chapter Kappa Sigs, and one daughter. 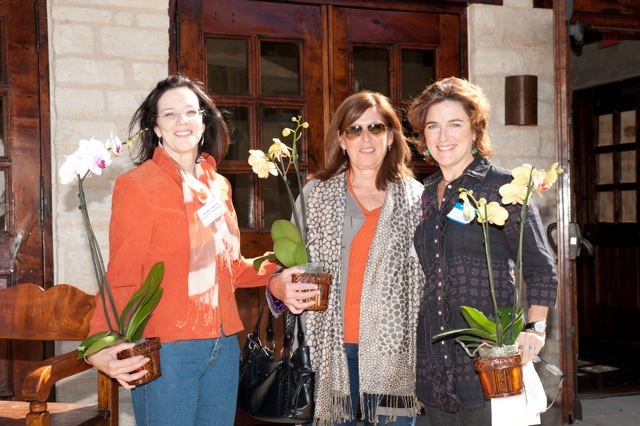 Organizing and hosting Parents' Weekend is a huge effort that is managed largely by the volunteer efforts of the Tau Chapter moms. If there was any stress behind the scenes, we never saw it. They pulled it off with great aplomb. Recognized for their outstanding efforts in providing a spectacular Parents' Weekend are (left to right): Margaret Regan, Parents' Weekend chairwoman, Cynthia Walters, treasurer & alumni liason and Julie Tysor Taetz, president. Hagen McMahon presents Elizabeth Phillips Horne with an Award of Appreciation for her many hours of hard work in refurbishing the Kappa Sigma House, staging the interior furnishings in the Lodge and handling a sundry of other details to make it picture perfect. 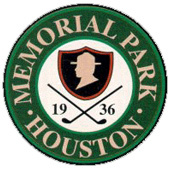 will be held February 22 at Memorial Park in Houston. 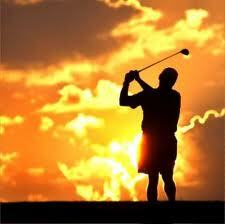 be posted to Tau Trustees website.